La Bonne Heure, translates to English as "The good hour" or "The right time". 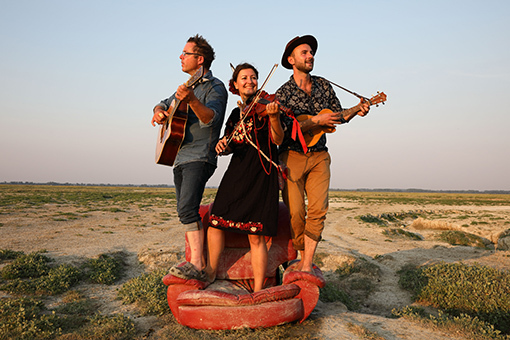 Brian Holmes, an Irish one-man orchestra, Madalina Drouvin, a Romanian baroque violinist and a French ukulelist, Hugo Cordonnier, are living proof that Folk music is still alive and kicking in the heart of Picardie, France. Inspired by their influences of Irish rhythms, 'finger picking' and Romanian spirit, La Bonne Heure certainly capture the magic of many shared emotions. Live on stage, their energies communicate without explanation. Since 2015 they have become a household name throughout the north west of France. 2019 will bring us their awaited second album. A musical trio, not to be missed!